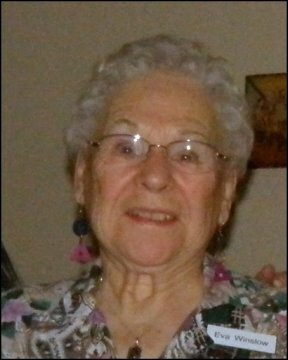 Eva Evelina (Lagasse) Roberge Winslow was born March 16, 1921 in Rolla, North Dakota, the sixth of sixteen children, to Dosithe and Josephine (Turcotte) Lagasse. She passed away on October 28, 2011 in Everett, Washington at the age of 90 years. She attended Minot State Teachers College and taught school. Eva loved to make her dance costumes and had closets full of them. She had a gentle laugh and would always listen intently to who ever she was conversing with. Eva married Edgar Roberge in 1941 and moved from North Dakota to “homestead” in Alderwood Manor in the early 1950’s. They raised 8 children before divorcing in 1974. In 1989 she married Arthur Winslow. Art and Eva enjoyed many travels together and were regulars at the square-dance hall. They gave up their nomadic ways for a quieter lifestyle to simply take pleasure in each other’s company. Survived by her husband Arthur Winslow (Everett, WA) and children Marie, Nicolette (Mark), Richard (Nancy), Thomas, Brian, ten grandchildren, and four great grandchildren. Eva was preceded in death by her daughter Renee, and sons Roland and Douglas. Rosary/Vigil 11/03, 7:00 PM at St. Mary Magdalen. Funeral Mass 11/04, 11:00 at St. Mary Magdalen. Burial 11/04 at Holyrood Cemetery. On the wings of angels to be with the Lord.